Homemade pie crust crackers. Honestly, it sounds much more complicated than it really is. I’ve found that with very little patience and a ton of creativity, food can be homemade without being extravagant or difficult. That’s not to say that for a quick dinner or salad, we’re not quick to pull from the pantry a sleeve of any ol’ crackers, but when we have guests or want something a little more ‘fancy’ with dinner, then having these pie crust crackers on hand is always a nice and welcome change of pace. These pie crust crackers are so easy to make and taste amazing! We love to eat them with tomato soup, especially, because the seasoning compliments the soup so well, but they go with just about anything. They’re light and flaky, so they tend to do better with soups or very soft dips. You can purchase any store-bought refrigerated pie crust. 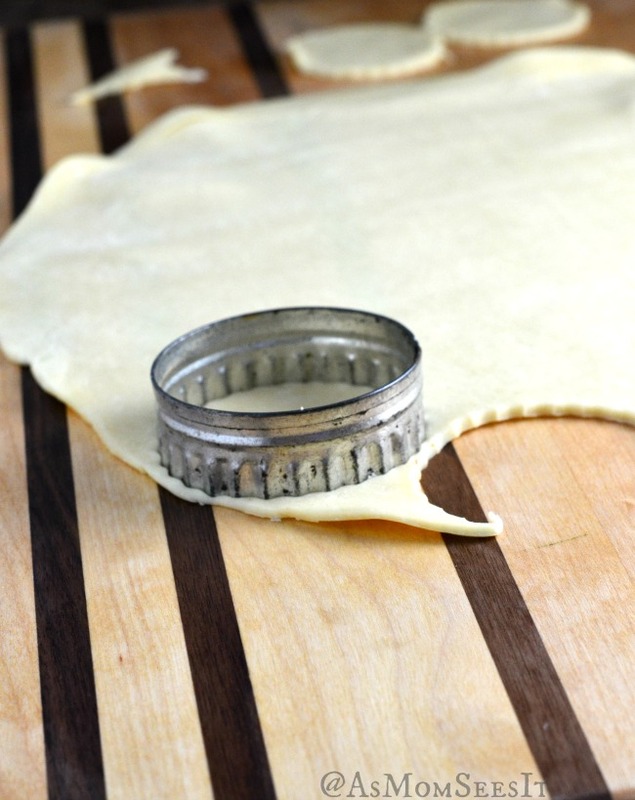 Unroll the pie crust onto countertop or cutting board. Most pie crusts are lightly floured on the surface, so you shouldn’t have to flour your work surface as long as you work quickly. 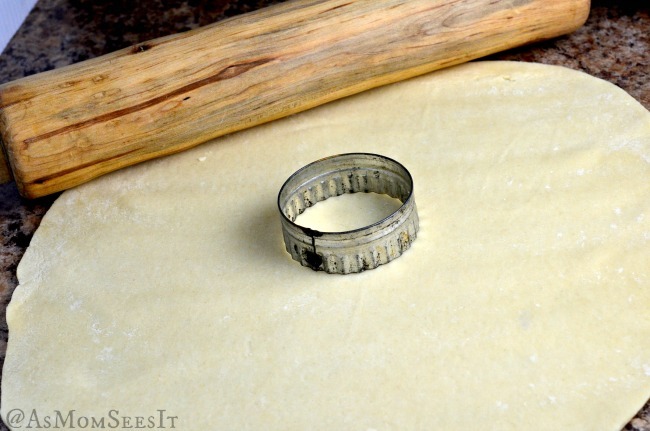 I found this rustic biscuit cutter at an antique store near us and I love it for these crackers! We’ve also used cookie cutters – the kids love the Mickey Mouse one we have – but any biscuit cutter or cookie cutter will do. Once you’ve used as much of the surface of the dough as you can, I like to roll out the extra so it’s the same thickness and use the rest of the dough as much as I can. 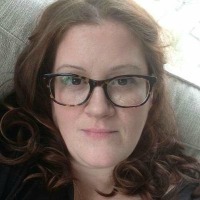 Each time you do this, however, you may need to add a little more flour to your work surface because kneading the dough will make the dough stickier the longer you work it. Once all the dough has been cut and laid out on a pan, brush with a beaten egg. This will give the pie crust crackers a beautiful golden brown color when they’re baked. Once they’re all brushed with egg, dust the tops of the pie crust with the seasoning mixture. 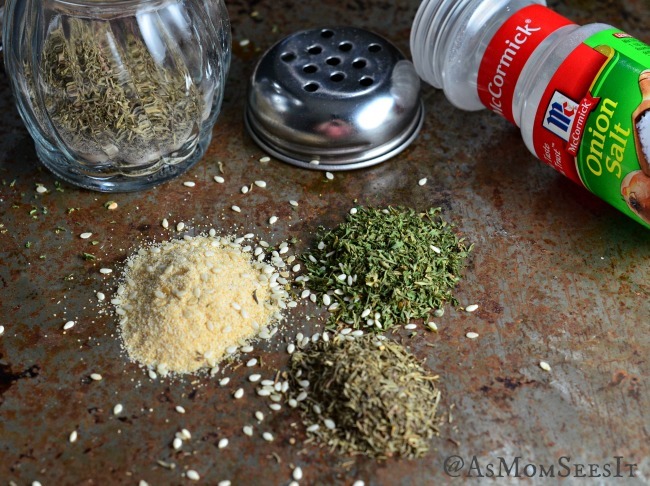 I like to keep my seasoning mixture on a shaker so I’m ready to bake each time I want to make the crackers. 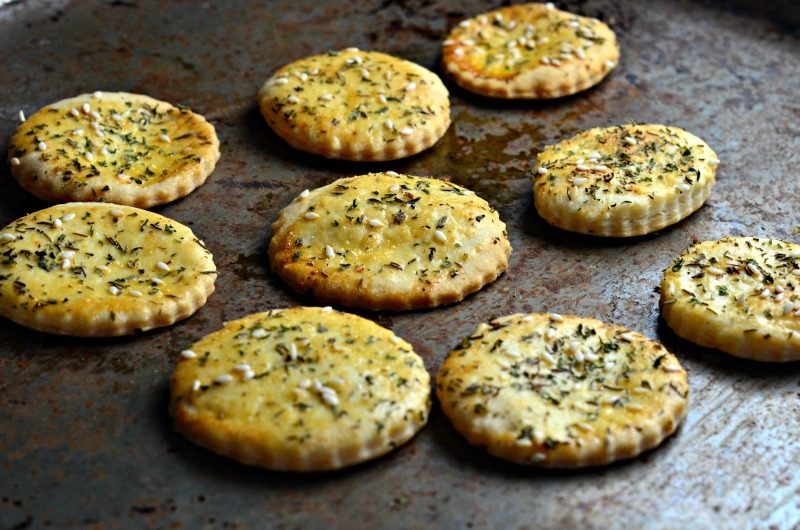 The pie crust cracker seasoning is simple; it’s 1 tablespoon of dried parsley, 1 tablespoon of dried thyme, 1 tablespoon of onion salt, 1/2 tablespoon of garlic powder, and a 1/2 teaspoon each of salt and pepper. Once the pie crust is topped with the seasoning, I like to sprinkle the tops with sesame seeds. Bake them in a preheated 400 degree oven for 8-10 minutes. They should have a beautiful golden brown color. As soon as they’re out of the oven, place them on a cooling rack. A light and crispy cracker that is perfectly seasoned and goes well with any soup, salad, or on its own as a snack. Beat 1 egg. 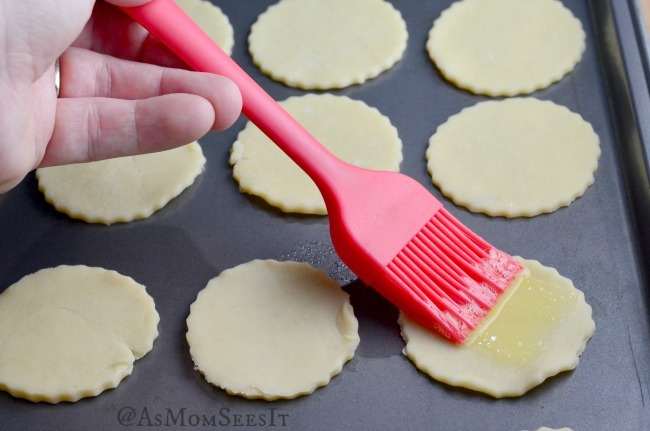 Brush each cracker lightly with egg using pastry brush. Sprinkle crackers with seasoning mixture and top with sesame seeds. The Culinary Vegetable Institute in Ohio: White House Cookbook Dinner Event Delicious! What a great idea! 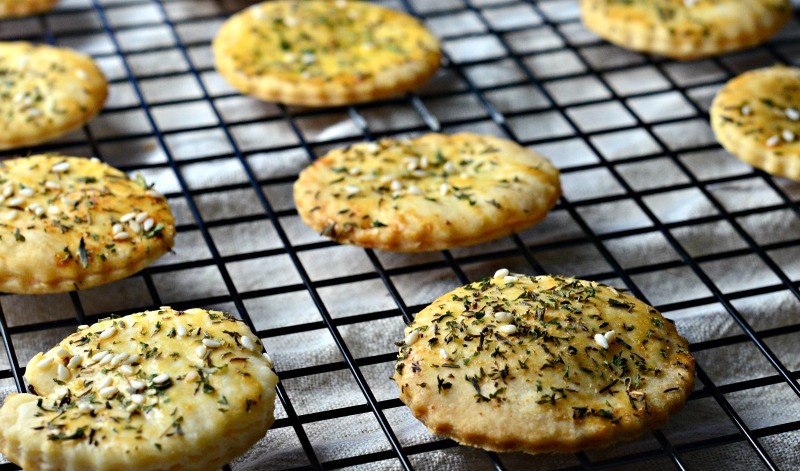 I’ve made pie crust cookies but never even thought of making them savory. Brilliant! Yes! 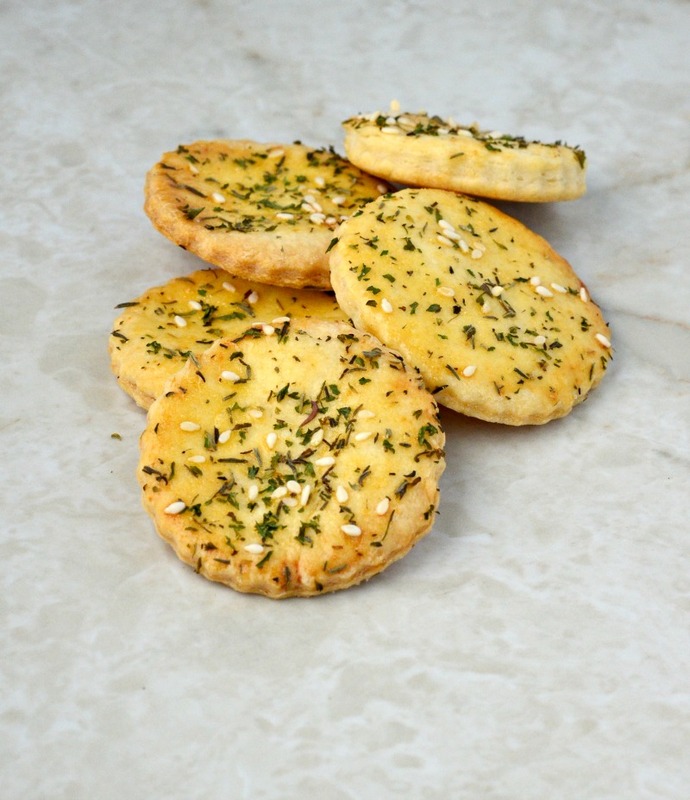 Thank you for your comment – they’re super delicious and I love how flaky and light they are. These sound great! Have you tried freezing them, to have them ‘on hand’ at any time? I periodically freeze a big batch of chicken pie pies, and this would be much easier, and maybe come out better than freezing in the crust.